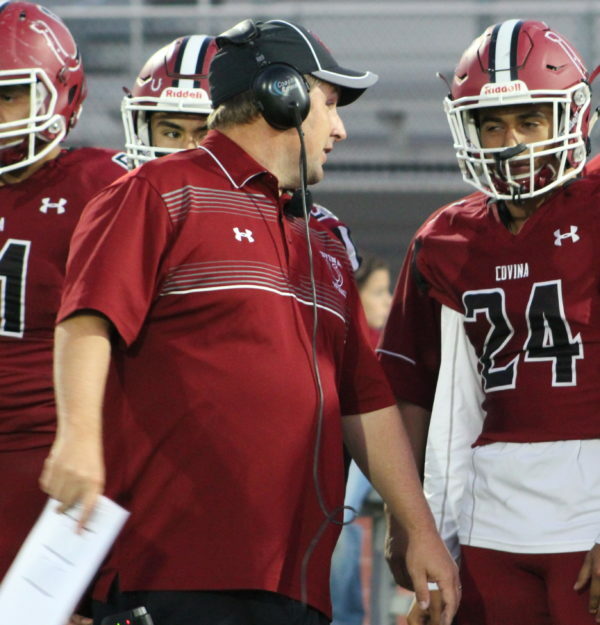 Joe Brown has stepped down as the head coach at Covina after a seven year stint. (Covina) – Joe Brown, who led Covina to the Division 11 CIF title game in 2017, has stepped down as head coach the school confirmed Wednesday. Brown, who has been coaching at Covina for 23 years, took over for Darryl Thomas after the 2012 season. He led the Colts to the playoffs in five of his seven years at the helm. His best year was in 2017 when he guided Covina to the Valle Vista League title and all the way to the Division 11 Championship game where the Colts fell to Katella 55-49. the run included a memorable semi-final contest at Culver City that the Colts won 57-56 in overtime. Covina finished 11-3 that year. Brown had an overall record of 48-32 in his seven-year stint and 5-5 in the post season. This past season Covina went 6-4 and missed the playoffs. In a press release the administration said that a search for a new head coach will begin immediately. According to sources, Brown isn’t retired as a football coach but will take some time off and consider his options. 20 Comments to "Joe Brown Bows Out at Covina"
Covina officially tied a teaching position to the coaching job today. It makes the most sense for K.G to take over the program, and I know m*a*n*y who would welcome him….but….I don’t think with already having track and the AD spot he wants the added headaches. I would actually lay money against it. Covina has been such a good ole boys club, I mean Brown is just one of a long line of inner-cricle successors from (what I can recall) Sheehan to Thomas (Didn’t the track coach get a crack too?) on down to Brown. Tongue in cheek, I’ll predict Lippert as the new HC. I believe that Coach Bacon has a teaching job along with coaching duties up at Oak Hills. Without a teaching opening at Covina it would make no sense for him to give what he has up. Covina already said they are looking for an on campus coach first. Everyone saying Big Lou will hand over the reins, and have heard rumors of a long time coach west of the 605 stepping down. But rumors are just that…rumors. But the ones that do, are winning! I would bet there would be movement at Cal for sure seeing as how they haven’t done much since Cal hasn’t made the playoffs in quite some time… Santa Fe won league last year and made improvements but this season was a disaster for them. I can’t see any other team in the Del Rio axing their HC. DRL and SGV Insider are giving opposite statements so what’s going on here lol? This is just the first domino to fall, just wait and see how many more schools will be without a coach soon, many resignations cuz many don’t want to be coaching from January to November.. It ain’t LS or ER, you say it ain’t Cal or SF, does that mean Whittier? Cal and SF both have already made changes that will have huge impacts. Interesting to see how it all plays out. A lot of disgruntled parents for both programs. I only deal with HC’s. A firing called a resignation will be announced Friday. Check Robledo on Friday night,he might have it. Del Rio movement coming next week. Tue or Wed. my guess. Unfair to name names. They may not know. So no movement in the Del Rio? Or was SGVN Insider referring to assistant coaches then? Congrats on a great run by Coach Brown, always seemed like a great man. With the job now open, the admin would be smart to contact Martin Bacon who was the DC until they cut his PE position at the school. Sharp mind and the kids love playing for him. California and Santa Fe will not be making HC changes. CIF would do so many coaches and their families a service if they brought back the no football until May 15 rule. Congrats Coach Brown. It’s nice to see head coaches go out on their own terms. I’am also learning that an effort is being made in many districts that schools let go of walk-ons and hire credentialed coaches. Schools are finding saving money by hiring walk-ons is no bargain. Lack of revenue, much higher probability of law suits, often not mature enough to handle teen problems. This will result in plenty of changes in the lower divisions. Expect movement in the Del Rio in a few days. Great coach even better man !!! Wish you well coach!!!! A coach will inherit a very talented and hungry team!!! A coach with experience like a spathias, mooney, maggorie.